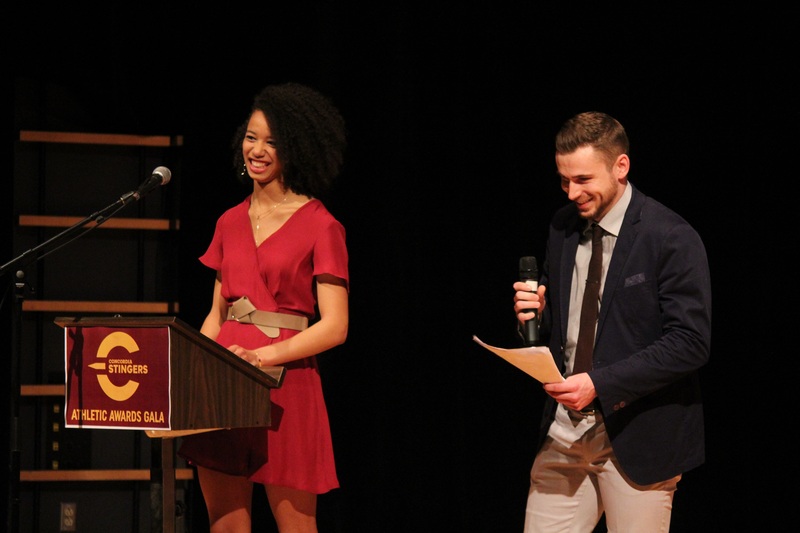 Athletes from all of Concordia’s sports teams packed into the Oscar Peterson Concert Hall at the Loyola campus for the Stingers annual athletics awards gala on April 6. The event was hosted by TV host Chantal Desjardins, who opened the evening with jokes that got the crowd roaring with laughter. Later in the night, the two Stingers valedictorians got on stage to leave the players with some words of wisdom, while also making some jokes at the expense of their teammates and coaches. The valedictorians were Antoine Marchand of the men’s hockey team and Emily Hickson of the women’s rugby team. Like Hickson, Marchand said he felt being able to speak on behalf of his fellow athletes was an honour. Hockey player Anthony De Luca won Male Athlete of the Year at the awards gala. Photos by Alex Hutchins. The first awards of the night were the President’s Academic Awards which were given to the female and male athletes who achieved the highest academic standing while demonstrating success in their sport. Hockey player Alexandra Nikolidakis won the award, as well as football player Patrick Mills. Immediately after, the Marvin Cooper Award, which is given to the athlete who has successfully overcome the most adversity, was awarded to football player Mickael Côté. Côté has been through shoulder and leg injuries in the past three years, but his determination to keep playing football is what ultimately earned him the award, according to the Stingers. About halfway through the evening, Interim Athletic Director D’Arcy Ryan handed out the awards for each team’s best rookie and most valuable player. Men’s hockey forward Anthony De Luca swept his team’s awards, winning men’s hockey team rookie of the year, while also being named MVP. De Luca led the men’s hockey team to their best season in 30 years, according to the Stingers. He scored 24 goals and recorded 19 assists for a total of 43 points. At the end of the night, De Luca was also named Male Athlete of the Year. While the awards may recognize individuals, De Luca said he could not have done it without his teammates. For the second time in her career, Alex Tessier took home the Female Athlete of the Year award. In women’s rugby, fourth-year player Alex Tessier won the team’s MVP award and, later in the night, Female Athlete of the Year. Tessier won the award in 2015 as well, during her second year with the Stingers. She has played with Canada’s national rugby team and was named to the tournament’s all-star team at nationals in 2016. In the last three years, the Female Athlete of the Year awards have all gone to rugby players, as Frédérique Rajotte won it in 2016. For Tessier, sharing the award with her teammate is special. After the awards were handed out, graduating football player Andrew Barlett said a few words to the crowd before being interrupted by hockey captain Olivier Hinse, who told Barlett he wasn’t actually the valedictorian. Of course, this was simply a joke Hinse and Barlett were already in on. As the crowd laughed and Barlett left the stage, Hinse introduced Marchand and Hickson for their valedictorian speeches. According to Hickson, the initial nerves she had about her speech were settled thanks to one of her classes earlier in the day. The night was also a send-off for this year’s graduating Stingers athletes. Marchand, who has been at the school for four years and has helped run the Swarm,—an organization dedicated to creating more unity around the Stingers—said he’ll definitely miss his time as a Stinger.